This particular hike was my absolute FAVORITE. I probably started to annoy my friends when I could not stop saying that I wanted to walk down into and in between all of the hoodoos. I'm pretty sure that within the day I mentioned it at least 7 times. I just wanted to explore man! This particular hike was actually unplanned, and we were initially driving to another viewpoint, which ended up being closed off for unknown reasons. We debated on just giving up on the spot, but instead we spontaneously picked a nearby spot on the map and chose this spot merely because it was named the "Sunset Point" and it was almost time to watch the sunset. Spontaneous decisions are often the best ones, because then my wish to hike down into the rock formations finally came true! I found the pinkish-orange tint of the sand and rocks to be extremely alluring, and I had wished we found this trail sooner so we could have explored the path even more deeply! Spend the next few seconds scrolling through the following photos, gawking in admiration at the colors of this gorgeous hike with me. 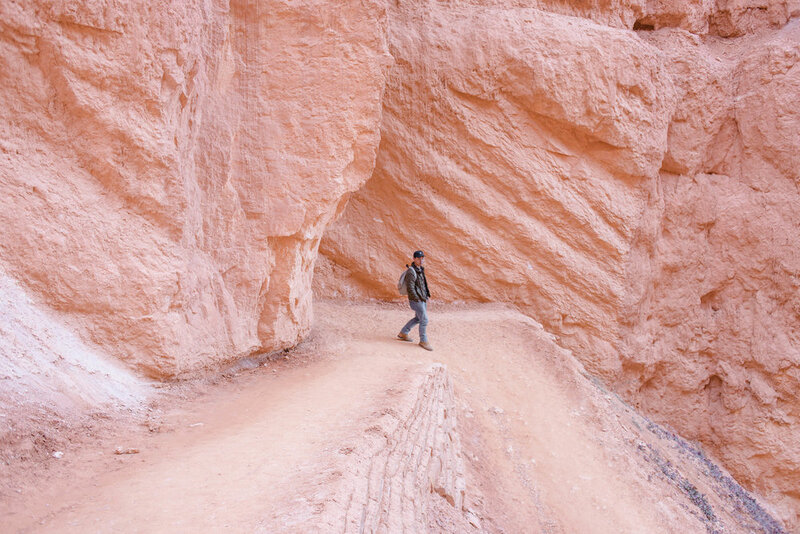 This Navajo Loop Trail is only a 1.3 mile roundtrip hike, with 550 feet (or 167 meter) elevation gain. It was pretty easy on our feet and burned our thighs quite a bit on the hike back up, but it is overall pretty relaxing! It was visually a very intriguing hike. 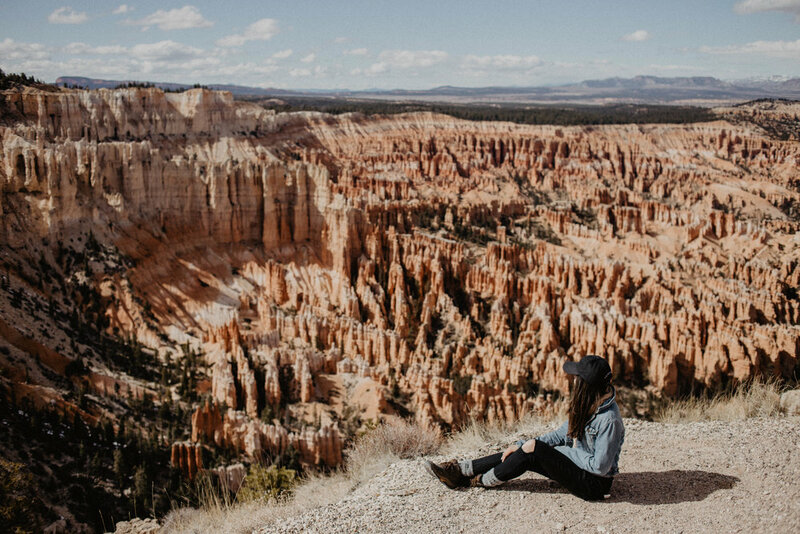 The hike featured beautiful high-up views of hoodoos and trees, a gorgeous switch-back section, and some cute little hole-like rock formations that Harry thought it would be cozy to take a nap in. Our group never made it all the way around the loops since we were losing sunlight very quickly, but I encourage everyone to finish the entire hike! It begins at Sunset Point, not far from the parking lot, and goes all the way down to the main amphitheater. For more information regarding the trail itself, click here. 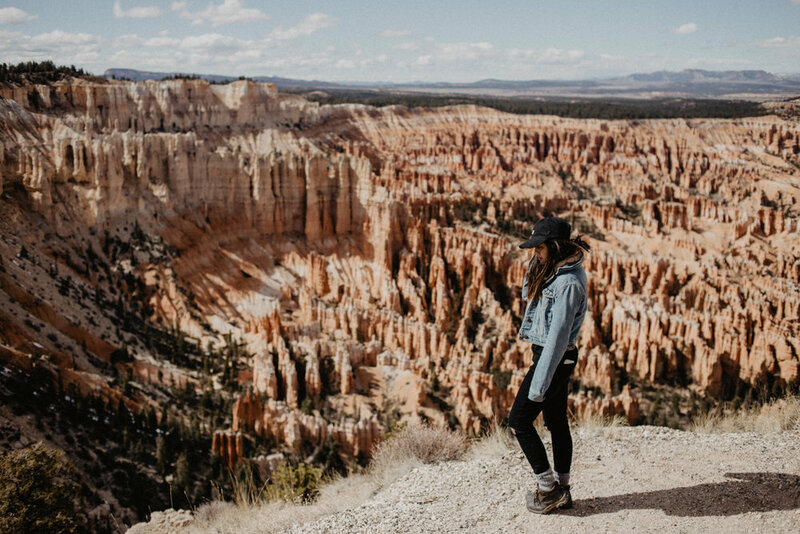 If you are looking for the iconic, well-known, picturesque view of Bryce National Park, this is probably the spot for you. Inspiration Point is again marked by the tall orange tinted hoodoos, a trail-way to walk that extends along the mountainside, and a tall cliff which you see me standing on in the photo pictured below. I obviously was not brave enough to go all the way to the edge but hey, good enough right? I promise, it's taller than it looks! I really loved this particular viewpoint because it provides a varied collection of views of the amphitheater. 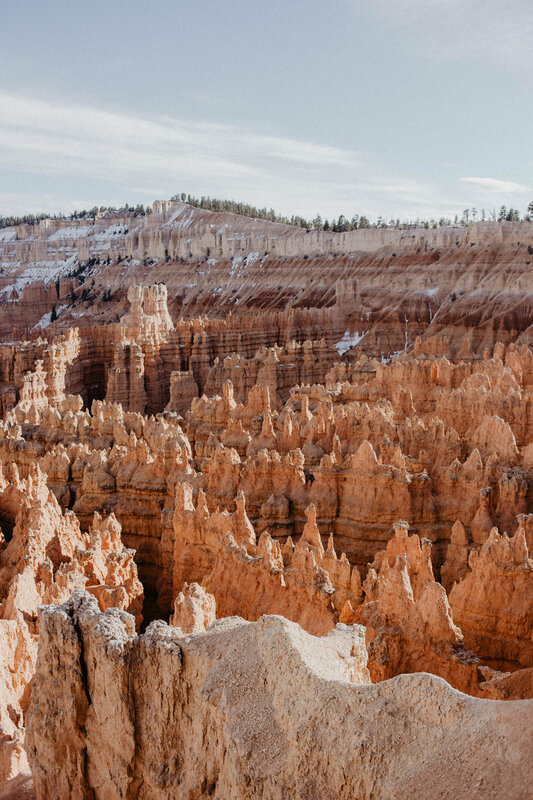 You can climb up to the top of the hill to look down in awe of the vastness of it all, or walk down the path a little bit and get a little bit closer to the hoodoos, where you can see a gorgeous lateral view of the natural structures. I love the warm orangey-pink tones of the canyon and could honestly see myself sitting, sipping some boba (sadly I had no boba with me at the time, sigh), looking at this view for hours on end. When we visited this particular viewpoint, it was not too crowded, which made the experience much more enjoyable! It was a vast, peaceful scene that really reminded me of how magnificent and big God made nature to be, and made me so thankful to be able to be a part of it. 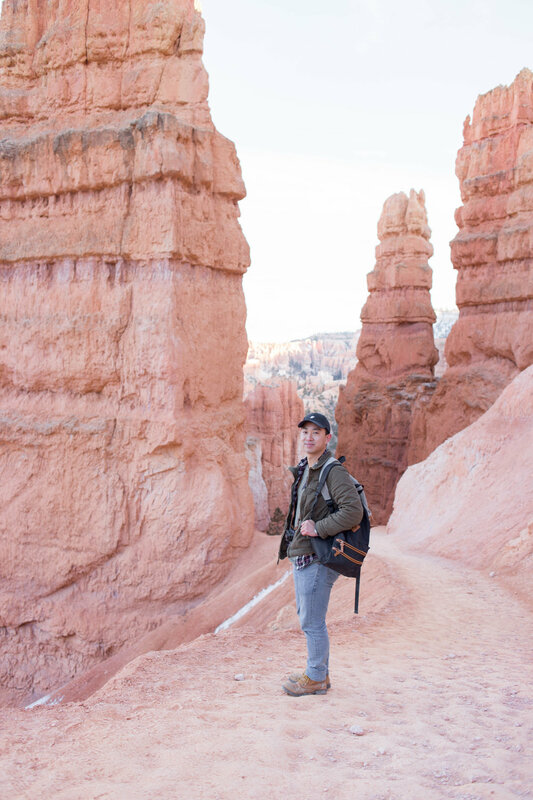 For a general overview of the itinerary we took for our 5 day roadtrip through Utah and Arizona, visited this page. Bryce is higher up in elevation though, so it proved to be much colder than the other spots in Arizona and Utah we visited during our roadtrip. Bring layers! Fallin' in love with the desert more and more every day I spend here.. EEP!